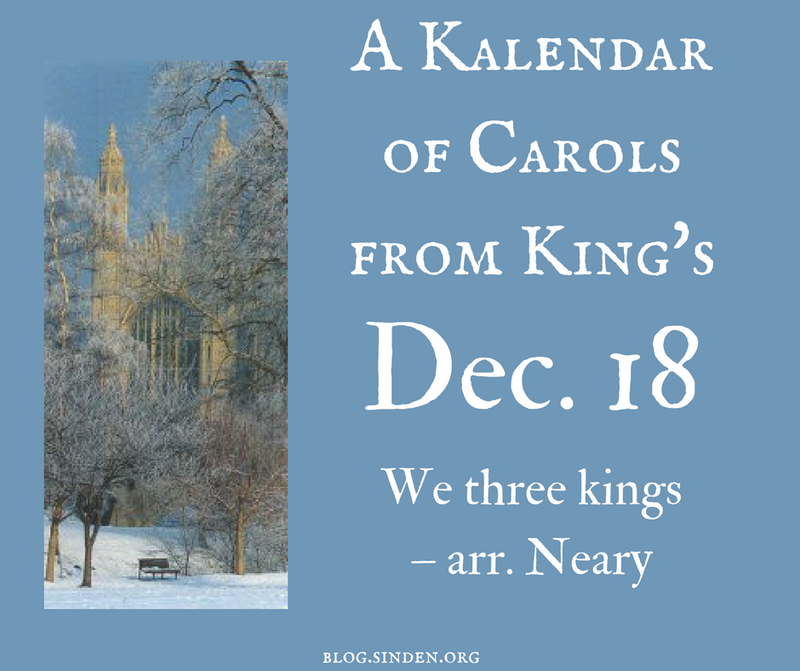 So far, we've covered the opening hymn, Bidding Prayer, In the bleak mid-winter – Harold Darke, Adam's Fall – Richard Elfyn Jones, Love came down at Christmas – arr. Stephen Cleobury, How shall I fitly meet thee – Bach, I saw three ships – arr. Ledger, Illuminare Jerusalem – Judith Weir, and the hymn "O little town of Bethlehem", A spotless rose – Herbert Howells, The Lamb – John Tavener, The Angel Gabriel – Pettman, The Linden Tree Carol – arr. Cleobury, this year's commissioned carol by Huw Watkins, Away in a manger – Willcocks. Can I not sing but hoy – Francis Jackson, and the hymn "God rest ye merry, gentlemen". 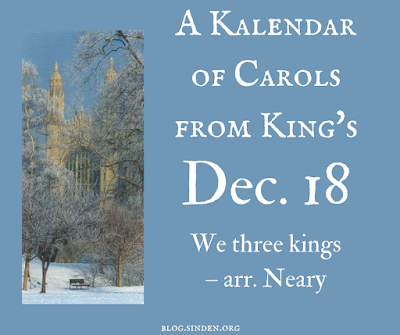 Martin Neary's arrangement of "We three kings" has not been performed at this service before, though it has been sung twice on "Carols from King's" broadcasts (note that this is a separate, pre-recorded service). Rather than yammer on about this carol, and why I like it (particularly the soprano bit during the "Myrrh" solo) I'll just let you view the score. Thanks to Tim at Encore Publications for sharing this with me. Here's the nicest version I can find on YouTube, much nicer than what I linked to in the preview.